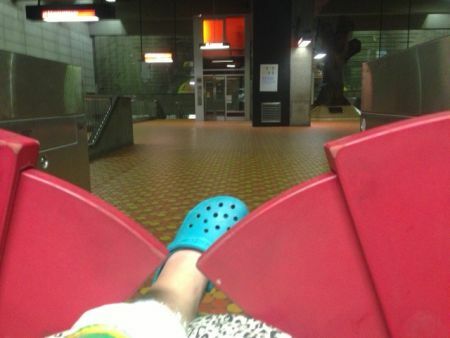 My leg got stuck in the red gate at Lionel-Groulx metro this summer. My femur was broken and I was in a wheelchair. The reason the strongest bone in the human body broke was not from a tackle in rugby, or a motorbike accident as you might expect, but an arthritic knee. I'm not going to go into the details, but suffice to say I am a mid-twenties woman with a physical disability. Aside from the accident, sometimes I walk with a walker, sometimes with a cane, always with pain. Always determined to get where I'm going. And I have to be, considering the daily barriers I face while using the STM. So there I was, my left leg outstretched from my wheelchair, the red jaws of the STM literally an inch away from my leg on both sides. This was the turnstile that is specifically designated for people with reduced mobility or pushing strollers. Had I been even a step further in the gate would have closed exactly on the part of my leg that is broken. The button to open it was not working. Commuters who were coming toward me tried to open the gate using their Opus cards. It did not open. Travellers exiting the metro pushed the button that is supposed to open the red gate from the inside. It did not open. Someone went to tell the STM employee who was working behind the glass. He took the next three customers in line and then came over and looked at my leg, and looked back at the line. He did not know how to open it. Then another traveller pried it open with her hands and I quickly went through. We chatted for a bit and she told me that her young son had been trapped in that exact exit as she was pushing him through in his stroller. We parted ways. I've learned not to go through those exits any more. So now when I go through the entrance or exit of the metro in my wheelchair I have to ask an STM employee to open the clear gate to let me through. I have to explain every single time why, and am sometimes met with a tort response and exhausted stroll over to unlock it, and am sometimes met with an understanding nod and quick step to help. I find the metro system positively crippling, paralyzing, debilitating. To put it into perspective: there are 68 stops on four lines that make-up the Montreal Metro system. Sixty-one out of the sixty-eight stops are not wheelchair accessible. All of the seven accessible stops are on the orange line. Only two of those stops are in the downtown core: Berri Uqam and Lionel-Groulx. Four stops are on the island of Montreal, the rest are at the more recently built ends of the orange line, those high-traffic areas such as Cadillac and Montmorency. 53 bus lines are not accessible to wheelchairs, while buses like the '26 bus line [are] accessible to wheelchair users at stops identified by a pictogram.' This means that a person in a wheelchair has to roll up to a bus stop, peer up to the sign at that stop to deduce whether or not they can in fact take the bus. I can't wait to try this STM approved procedure when it's minus twenty and blowing snow. The infrastructure is not there. It seems there is little will within the STM to make it better. For 2014, there is one station scheduled to have elevators installed. At that rate, it will be 2074 before all the stops in the Montreal Metro will be accessible. TVs are scheduled to have been installed in 51 stations by the end of this year, and two sculptures, as well as one mosaic will have been restored this year as well. Changes are happening in the metro system, they're just driven by the mentality that we need esthetically pleasing, and revenue-producing changes, in the form of advertisements that play on the screens, instead of changes that make the metro system more accessible. If there was a shift in priorities, perhaps our city would match the likes of Toronto, Vancouver and Calgary, which boast infinitely higher elevators, increased signage, and announcements at each stop. All 170 bus lines in Toronto are accessible to wheelchairs. Just under half, 31 out of 69 Toronto subway stops have elevators. Information on the elevators' status is provided by a phone service. All buses and streetcars announce stops for visually impaired commuters. Buses are required to stop between stops for people with disabilities, within the limits of safety, between 9pm and 5am. Montreal has made no such effort. Toronto is doing better than Montreal in terms of transit accessibility, and they also have a ways to go to reach universal accessibility. Two months ago, my mother who was in town to help me out while my leg healed, and I ventured to the Old Port to take in the closing ceremonies of a festival. We took the 715 bus from Berri Uqam to the Old Port. It was 10pm. When we needed to disembark the driver told me that I couldn't get out there. He drove five more blocks. I told him we really had to get off – by then we were out of the Old Port. He told me he couldn't lower the ramp here because there were stairs. Bear in mind that there is a policy within the STM bus system that if a woman requests a stop between stops after dark the driver has to allow her this security measure, within the constraints of safety. In this experience, we - two women could not get off the bus, after dark, even at established stops. When we were finally able to get off the bus, the driver informed us that this line was not accessible to wheelchairs. Expressing confusion, I asked whether it was because the buses did not always have ramps. He told me its not his fault, its the law. I said, OK, but what was the law he was citing? He got out of the bus and showed me the stop – there was no wheelchair symbol. Meaning I should not have gotten on the bus because I might not be able to get on the one that comes back when I need to leave. How was I to know that there would not be a small wheelchair symbol at the stop I needed to disembark at? This information is not available on the STM cellphone app or the website, at least not in all my searching. The STM app, which is currently approved by the STM Board of Directors for a facelift and reward points system, could certainly be improved to indicate which stops are wheelchair accessible and which are not. I have faith in public transit, I believe in the power of communal transit for an ecological movement, a social way of being in a community, and for convenience and personal financial reasons. But since I have been in a wheelchair, every time I travel with the STM I experience at best, a high level of confusion, and at worst, dangerous and human rights-denying treatment. Note that the declaration commits to transit access 'on an equal basis', not to the extent that there is enough money, outside of refurbishing statues and subsidizing rewards programs for transit users, such as the STM Merci program. It states that access to transit and public spaces needs to be on an equal basis as someone without a disability, say someone who is able to walk up and down 40 stairs every time they need to take a train. Back to my leg being stuck in the turnstile: why was I using the metro if it is so dangerous for wheelchair users anyway? I had, at that point, not been approved by Transport Adapté. It had been seven weeks that I was in a wheelchair. Seven weeks since I had needed to ask either a friend or family member to push me to where I need to be. Seven weeks into what turned out to be a fifteen week long approval process for adapted transit. Why is it that in a city that boasts cosmopolitanism, inclusivity, a something-for-everyone mentality, that a woman in a wheelchair cannot take the metro or bus without being seriously at risk of bodily harm? Are the places I need to be less important? Am I expected to have the capacity to pay for private adapted transit? I made that mistake once, it cost me sixty dollars to go from near Lionel-Groulx to Notre Dame Hospital. A trip that would have cost 3 dollars and taken less time if Sherbrooke metro had elevators. Does the STM assume that I, and my fellow reduced mobility travellers simply have nowhere to go? Am I required to conform to the infrastructural demands of the city in order to take public transit? But matching those ableist infrastructural demands and alienating bureaucracy of the metro system, is the mentality of the people on the trains. From pushing past me as I struggle over that large gap between the platform and the train, to insure they get a seat, to malicious or ashamed glances, to inappropriate questions, like 'why are your hands like that? ', the encounters I have on the metro among my fellow travellers often leave me feeling like excluded, observed but not really seen. They often leave me feeling like people see me as a wheelchair as opposed to a person who happens to be using a wheelchair; as someone living a negative reality because I have a disability, as opposed to someone who is living her life, taking the metro, and who may have a unique perspective to share, because of the experiences she's had due to having a disability. I don't see my disability as negative. At all. In fact, I see my experience as a wheelchair user as positive: it is liberating to be able to go farther and faster than I could have walking before my accident, due to pain. However, what I do see as negative is the constricting and exclusionary physical and social infrastructure that surround me in Montreal. For me, this is the negative side of having a physical disability. Its not the fact that I was born with a different body than the norm, but that this city and it's transit system is shaped in the image of the 'normal' body, and is not open enough to making changes that would make it possible for me and other people with disabilities to access it. I, along with many others, are committed to holding the STM to its commitment of universal accessibility. We have been attending board meetings, offering our time and energy in the process of achieving universal transit accessibility in Montreal. We just started a group dedicated to accessibility called Accessibilize Montreal! with the goal of joining the fight for accessibility in Montreal, and breaking down stereotypes about disability. We'll get there. And in the meantime, when you and I see each other next on the bus or metro, you can make my trip a bit less alienating by acknowledging me, waiting for me to get out before you push past to get on the train, or offering to flag down the train conductor by the mirror to signal that someone in a wheelchair is exiting the train. You can try not to hit my legs or chair with your bag, you can move your bike quickly when it is clear I need the area designated for people in wheelchairs, instead of waiting for me to indicate that I need it, or rolling your eyes in frustration when I express that need. You can smile at me, you can look inquisitively. Just don't pretend you're not. And to those of you reading this who've experienced similar things, I urge you to get in touch with Accessibilize Montreal!, call STM board members, write to the media, record your experiences, talk with your communities about the structural discrimination we face. Remind yourself that this is not the norm in other major cities in Canada, that there are international and Constitutional standards that Canada has signed onto, and remind yourself that things will change. I'm a freelance journalist and activist based in Montreal. I contribute to CKUT's news collective, and regularly host Native Solidarity News. My main areas of interest are Indigenous solidarity and fighting ableism in Quebec.